If at first you dont suceed. 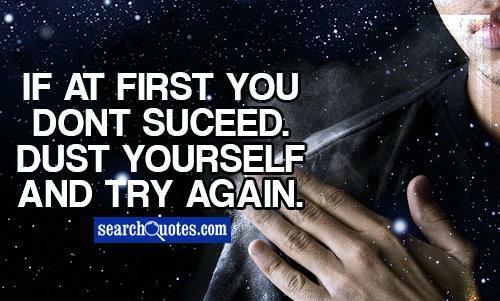 Dust yourself and try again. Your love is a one in a million, it goes on and on and on. You give me a really good feeling, all day long. I've been holding back this secret from you, I probably shouldn't tell it but if I.. if I let you know... you can't tell nobody. I'm talking about nobody. Are you responsible, boy I gotta watch my back... cuz I'm not just anybody. Is it my go, is it your go. Sometimes I'm goody-goody, right now I'm naughty-naughty. Say yes or say no, cause I really need somebody. Tell me you're that somebody. No one knows how to love me quite like you do. I gave it all to you, with no questions asked. I wanted a future, who cares about the past? New Updates! (4/25/2019) We've been working really hard on completing our membership system so you can submit quotes and keep track of them. Once this is complete in the coming weeks there will be a lot more quotes by Aaliyah and other authors. We've also changed the sorting on the site so you now see the latest Aaliyah quotes first. Our goal is to have the best Aaliyah quotes on the web!